To me this was the perfect Aliens story in many ways, gun's and grunts and company dodgy dealings a plenty but with a nice human story woven in too. The Aliens were presented well with face huggers and drones a plenty causing fear and death.If you like Aliens the movie you'll love this. 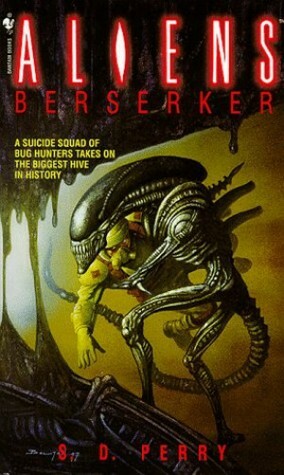 The title page says "Based on... the Dark Horse graphic novel Aliens : Berserker by John Wagner, Paul Mendoza, Andy Mushynsky" but sadly, the 4-issue mini-series was never collected as a graphic novel. the comic came after the 8 "main" series, following Aliens: Stronghold and serving as a prequel to Aliens vs. Predator: War (also a sequel to the original Aliens vs. Predator). The comic was also the first one to mention Weyland-Yutani, whereas previous series had their own main "bad companies" overseeing the bad things happening: names like BioNational, Chigusa Corp., Grant Corp. and Z.C.T.Since I can't review the Graphic Novel, I'll review it here and the novel adaptation by S.D. Perry (her second solo Aliens novel.) the story by Judge Dredd creator/writer Wagner is very frantic and intense in places, and there is no mercy for the main characters. He takes the main element of the story directly from Steve Bissette's Aliens: Tribes, the concept of a Berskerker squad of bug-killers who consists of a ground leader, a "baiter" (guy who willingly gets taken by the aliens to be brought to the Queen to reveal her location from his tracer), a heavy-weapons specialist "Drake"-type, and an unseen guy imprisoned inside a two-ton, invincible, heavily-armed and -armored killing machine named a MAX. (Note: in Tribes it was named a MOX: Mobile Offensive ExoWarrior.) In this story, the squad is made up of convicted felons who volunteered for the post in order to get their sentences reduced.They are led by Commander Eric "Pop" Izzard who never takes part in the infiltration missions, and helped remotely by 2nd Lt. Katherine Lara who is more on the team's side. There is also a recent member of the team, a young techie named Brian Ellis who is in charge of "controlling" MAX by checking its life-signs and cutting off the sedatives and injecting adrenaline whenever the killer man-inside-machine is needed.Perry handles the story expertly, and the story is told from alternating point-of-views of all the main characters, except the MAX and Pop (for reasons that become clear towards the end.) There are few changes from the original comic, one of which is the less horrible way one of the characters dies (which makes one feel like Perry had perhaps grown attached to and had pity on.) Her most interesting contribution is the psychology she created for the characters: Lara's deteriorating relationship with Pop, Ellis' rise from being ridiculed as a kid and trying to become a brave man, Teape's experiences as a prisoner in the hives slowly driving him insane, Jess' struggle to keep his team together and Pulaski's love of candybars and heavy workouts.Needless to say, some of the characters escape the whole mess of a crazy mission gone wrong, since their story continues in AvP: War. A recommended book, and also the comic is recommended first if you can get your hands on it. It is included in one of the Aliens Omnibuses under the title "Aliens: Frenzy" for some reason.NOTE: for unknown reasons, the previous graphic novel Aliens: Stronghold was not adapted into a novel, and Berserker was chosen instead probably because Perry wanted to write the adaptation for the sequel to AvP: Prey, titled AvP: War, and this one takes place between the two. The ending was ambiguous and that drives me crazy. For some reason this book is hovering around $20 on Amazon. This fact is probably due to scarcity from the printers rather than being one of the better written books of the Aliens series. I am in the process of downsizing my library, and one of the booksets that I've decided to toss out is this one. However, these books hold a sentimental spot in my heart, so I decided to review and read through at least one once more. Aliens Berserker was the book that I decided to revisit.The plot is very simple, even a bit simplistic when overanalyzed. A group of convicts (in the process of being rehabilitated I suppose) sign up for bug extermination duty in exchange for shortened prison times. Along with these three hardened "bad guys" are a Marine spaceship captain, a female communications officer, and a tech geek running the company's specialized bug destroyer MAX -- another convict surgically inserted into a hyped up exoskeleton made to rain death down upon the xenomorphs. Fortunately this last guy is kept doped up until required to go into action and then pumped up with adrenaline shots. Several questions come up at this point. Why would the company entrust such potent firepower and expensive machinery in the hands of convicted criminals. To be sure, the author paints them as nice enough people, but there is no logic in giving thieves and murderers weapons like this. The natural consequence would be rogue ships going berserker -- ha -- and becoming spacefaring pirates, which actually may have been an interesting story in its own right. However these prisoner soldiers are loyal, if not to the Company, then to themselves, and enter into a potentially fatally inescapable situation with not much more than depressed sighs and a swallowing of their fears. This whole fact strained my suspension of disbelief.Here is another big question. Why is there a human inside MAX? This is a big one. Seemingly the Company has developed a weapon that is capable of taking down entire nests of aliens -- the only other viable option is to nuke 'em from orbit -- but the whole thing is controlled by a flesh and blood -- read: weak-link -- operator. There are no androids in this book. But, and this is a big but, synthetic humans are an established institution in the Aliens series. They are ultimately loyal to their programing, and unlike these humans, probably not likely to rebel against the Company. Why is their no android intelligence controlling MAX? From the Company's POV this should be better than another convict in a suit. From a storytelling POV this works better too -- as the familiar trope is the android turning on the humans. This would greatly be ramped up in a situation where the humans are stuck between a killer robot running amok and the mindless and ruthless killing machines that are the xenomorphs.These two questions constantly distracted me from this novel. It was a good enough book, but I couldn't stop thinking about how it could have been better. As it is, the characterization is good. I was rather taken aback when some of them died. It happens late in the book, but I kind of got it into my head that, even though this is a juvenile spacemarine sci-fi horror thriller, maybe it would break the mold somehow and let all of the cannon fodder survive. This doesn't happen, though the deaths are treated with much more tenderness than one would consider possible. There is plenty of blood and gut -- mostly acidic -- but the alien carnage doesn't affect the reader as much when the already small group (only six humans, plus MAX) starts to diminish.If you are like me and have a bunch of these Aliens books saved up that you haven't read in quite while, then you could do a lot worse than reading this one. Fairly good story. Great art - liked this more than most I've read thus far.Probably the art was one of the main reasons I've decided to give this one 3.5 out of 5 stars. S.D. Perry - SD Perry (Stephani Danelle, by the way, though she prefers SD or Danelle) has been writing novelizations and tie-ins for most of her adult life. Best known for her work in the shared multiverses of Resident Evil, Star Trek, and Aliens, SD is a horror nerd and an introvert. Her father is acclaimed science fiction author Steve Perry. SD lives with her family in Portland, Oregon.